Also known as hopper windows, basement windows in Chicago can add a really nice touch to your basement. Increased natural light, improved airflow and added security can make your basement more comfortable year round. New Feldco replacement basement windows will rid you of the hassle of operating your old, worn out basement windows. Our basement/hopper windows have a single sash that’s hinged at the bottom and opens inward from the top. Installing Feldco basement windows will greatly improve the look and feel of your basement. Basements are naturally darker than any other room in the house because they’re usually underground.. Using electricity to fully light your basement can hike up your bills. Adding basement windows boosts natural light so you don’t have to depend on electricity for all your lighting. 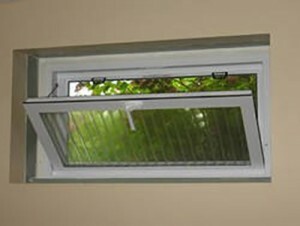 Our basement windows also have a screen on the interior of the window to let fresh air in and keep unwanted pests out. 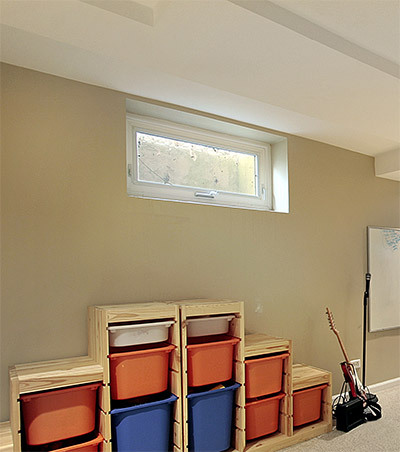 Feldco basement windows provide the ultimate in energy efficiency for your home in Chicago. With features like multi-chambered construction and insulating foam compression wrap, your basement windows are extra strong and will protect your basement from the outside elements. With a single sash that opens inward, it’s easy and convenient to clean your hopper window’s interior and exterior. For added privacy and safety, you can install a semi-frosted, patterned privacy glass treatment to your basement windows. The most notable use for hopper windows is in your basement. However, they can be put in other areas where you need a little extra sunlight or ventilation like bathrooms or laundry rooms. Another thing to note is that you don’t have to settle for only basement windows in your basement. If the space allows for it, other window styles like sliding windows can be a great addition to your basement.